On Monday, the government of Malta announced that an international team of researchers has discovered the wreck of a 2,700-year-old Phoenician trading ship and its cargo off the island country’s coastline. The ancient shipwreck may be the oldest ever found in the Mediterranean Sea. The discovery was made several months ago one mile off the coast of Gozo Island, the second-largest island in the Maltese archipelago. Nearly 400 feet below the surface of the Mediterranean Sea, researchers located a 50-foot-long sunken ship and its cargo strewn over a 700-square-foot area. The remains included 20 lava grinding stones weighing nearly 80 pounds each and 50 amphorae—large ceramic jugs with two handles and narrow necks used to hold wine. Since the Mediterranean’s sandy seabed cushioned the impact of the wreck, the relics were well preserved and could be dated to 700 B.C., which could make the discovery the oldest shipwreck in the Mediterranean. The ancient Phoenician ship was typical of the trading vessels that stopped in Malta to sell cargo, and since researchers discovered seven different types of amphorae in the wreck, they surmised that the ship had made numerous ports of call. It is believed that the vessel was sailing between Sicily and Malta when it met its watery demise. Independent Phoenician city-states such as Tyre and Sidon flourished along the Mediterranean coast on the western edge of the Fertile Crescent (modern-day Lebanon and portions of Syria) at the dusk of the Bronze Age and the dawn of the Iron Age. The Phoenicians were a maritime people known as master shipbuilders and merchants who plied ancient trade routes across the Mediterranean from 1550 B.C. to 300 B.C. They were known among ancient cultures as purveyors of purple dye extracted from murex snails that was used as pigment for royal clothing. Phoenicians traded their coveted dyes and woven items for raw materials, and they are credited with developing the first known alphabet, which is generally considered the forebear of all modern alphabets. The civilization ended after they were conquered by the Persians and then the Greeks. Phoenician traders were thought to have been the first known inhabitants of Malta, which makes the new discovery of particular interest. They were drawn to the archipelago’s safe harbors that offered refuge on long voyages. The research expedition, which has taken place under the supervision of Malta’s Superintendence of National Heritage, has been conducted by the GROplan Project, which is funded by the French National Research Agency. The international team of researchers includes scholars from the University of Malta, University of Marseilles and Texas A&M University. “The discovery is considered to be unique,” University of Malta researcher Timothy Gambin said in an interview with the Times of Malta, “because it is the oldest shipwreck in the central Mediterranean and it is in a fantastic state of preservation.” Gambin says the technical team is now working on compiling the data gathered in their fieldwork and creating a very high-resolution 3D model of the site based on more than 8,000 photographs taken of the wreck. They are also continuing to study the samples raised to the surface. “It’s an important reference point for the entire central Mediterranean,” a Maltese culture minister told the Times of Malta of the shipwreck. 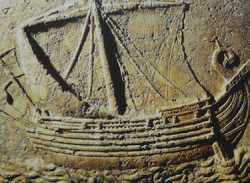 “It is a point where we can understand interregional trade and exchange in antiquity.” Researchers hope to find additional artifacts and portions of the ship, and the government of Malta plans to disclose the location of the wreck after all work at the site has been completed and relics have been recovered. The government plans to add the shipwreck to its national inventory of cultural properties and eventually make it accessible to the public.